Posted December 5, 2015 by Heather Michet & filed under DIY, Food As Medicine, Health Tips, Recipes. Even though you may be tempted to reach for the jug of highly sweetened cranberry juice when you get a uti (bladder infection), the sugar level in these commercially available juices negate nearly all of the benefits that the tart cranberry has to offer. You can certainly make your own fresh cranberry juice, but I prefer having Cranberry Concentrate on hand. 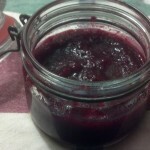 Inspired to create a “cranberry something” that my uti-prone feline* could, and would, consume (read: something I could sneak into wet cat food and get away with it), I came up with this super “clean”, easy and inexpensive cranberry puree. 1 12 oz. bag fresh cranberries. It’s ok to use frozen berries that have thawed slightly. Pour 1/4 cup water into blender. Add cranberries. Whiz up to a puree consistency. If blender is working too hard or berry mix seems too ‘dry’, add 1 Tbsp. of water at a time, then blend again, to arrive at a thick, yet spoonable paste. Pour into glass container and cover with lid. Refrigerate. Keeps for several months and can also be frozen. * For cats: I mixed 1/4 tsp. of cranberry concentrate into 2 Tbsp. wet cat food along with a bit of yogurt to mask the tartness. For the humans: Don’t make this just for the cats in your life! Add 1-2 tsp. puree to yogurt, smoothies, and fresh juices to balance acid/alkaline levels and increase health. Adjust the amount to meet your pucker limit! While Cranberry Concentrate is not sweet in flavor, the benefits are a super sweet deal. *Legal Lingo: Before giving any food or herbal preparation to cats, dogs or other domesticated pets, check with your veterinarian. None of the suggestions in this post are intended to diagnose, treat or prescribe medical conditions in cats or other creatures.